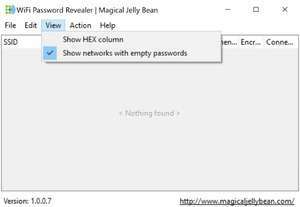 WiFi Password Revealer is a small free utility which allows users to recover passwords which are related to wireless accounts currently saved on your Windows PC. This program comes in handy when you've forgotten your wireless password and you're unable to view the password which is normally hidden by asterisks. Please note that in order to effectively use this application, you are required to be signed in as a user which administrative rights. For security reasons, you should also check out the WiFi Password Revealer download at LO4D.com which includes virus and malware tests. Additional screenshots of this application download may be available, too. WiFi Password Revealer has a presence on social networks. WiFi Password Revealer download been highly rated by our users.